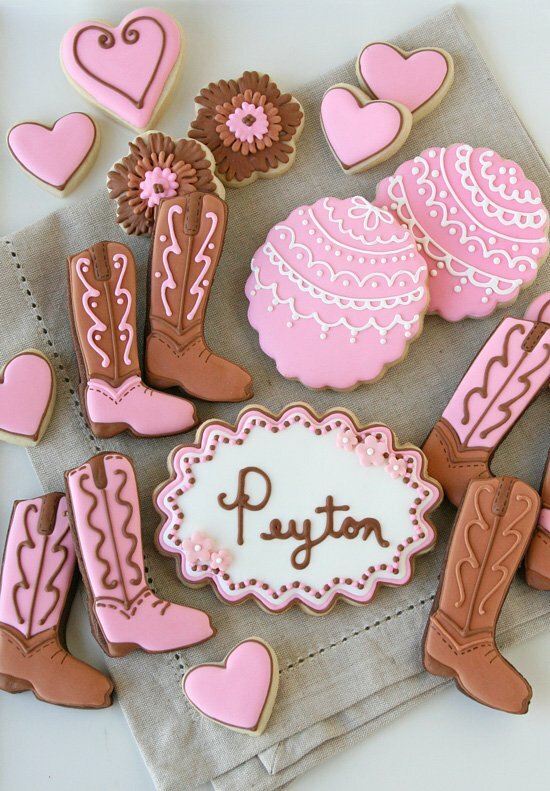 I recently made some fun Cowgirl Boot Cookies to coordinate with a Cowgirl Birthday Party my girls were invited to. 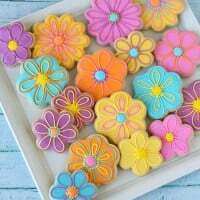 I’ve wanted to play around with a girly western theme for a while, so I was very excited when a friend who is well known (in our little circle) for her beautiful parties accepted my offer to make cookies for the party. The Cowgirl Party was going to have a bit of a vintage feel, with colors of pink, red, and brown. I made lots of girly boot cookies, but also included some fun bandanas (inspired by Sweet Sugar Belle), pretty lace cookies (inspired by Rosey Sugar) and some simple hearts. Prepare a batch of cookies, using my Sugar Cookie Recipe or Chocolate Rolled Cookie Recipe. 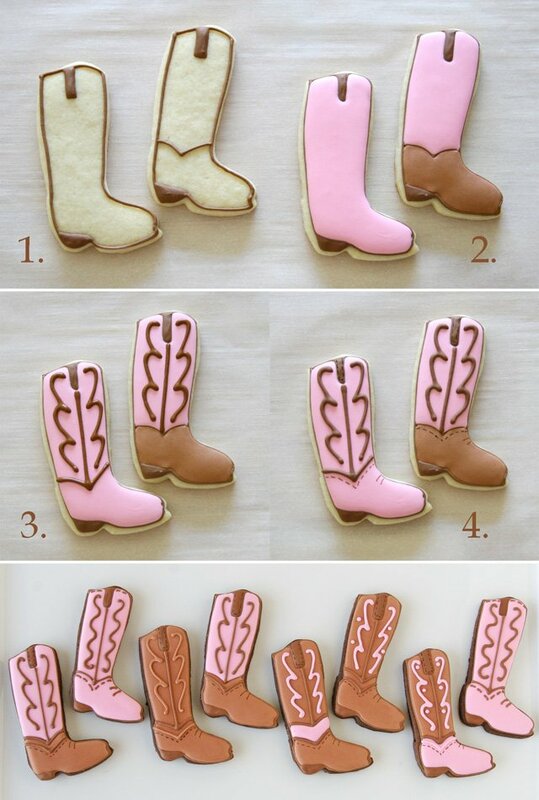 For the boots, I used a cutter like this Cowboy Boot Cookie Cutter , and cut off the spur (before baking). 1. Outline the boot with brown icing, and fill in the boot heel as well as the pull strap (as shown). Allow icing to set, about 30 minutes. 2. Fill in boot with icing color(s) of your choice (in this case, pink). If you are filling in with two different colors, fill with one color first (such as pink), then wait until the pink has set up (about 30 minutes) before adding the second flood color (in this case, lighter brown). 3. When the base icing is set (about 1 hour), add details as shown below, with brown icing. As anticipated, my friend Kristine (the birthday girl’s mommy) did a beautiful job with the party, and I was happy to see my cookies fit in so well…. In addition to a beautiful sweets table and several cute crafts, Kristine has a photo area set up with hay bales and fun props. Here are my two cowgirls (decked out in western wear loaned to me by my friend Bethany). These cookies are my hands down favorites! 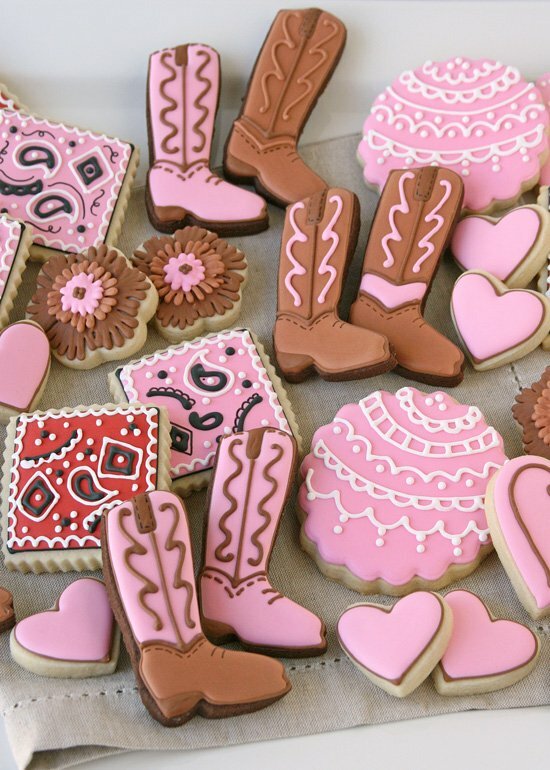 I want pink cowboy boots…but at my age, pink cowboy boot cookies might be more appropriate! I wish I had little girls to bake for. Really cute Glory! Too cute! 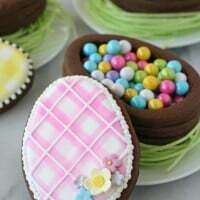 With all that work put into decorating them – I’d hate to see someone eating them!! Ha! Ha! Those are soo cute!! I love the little bandanas to! This is just totally stylish and adorable. I don’t usually comment, nor am I particularly interested in cookies, but this is LOVELY. love the whole set! the bandanna cookies and the “lacey” ones go perfectly with the boots! Wow, so absolutely gorgeous!! You are very talented! Oh my gosh, these are beyond precious…love them, Glory!! Adorable! Thanks for sharing the tutorial. 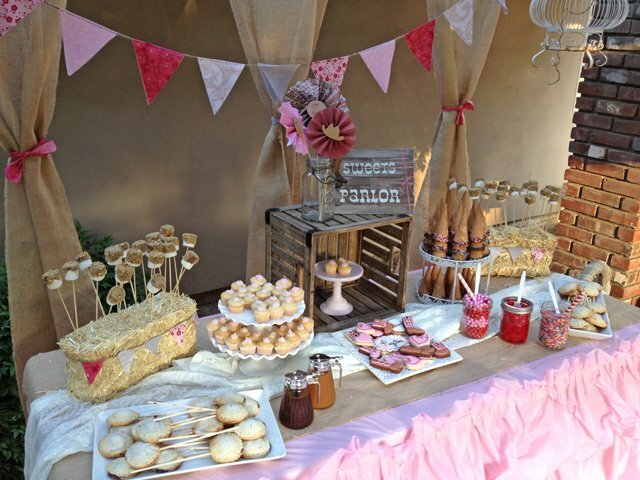 Those would be so cute for a rustic bridal shower as well! You always share such great ideas…. Your two cowgirls are so cute! What a fun party, and your cookies are the “icing on the cake”!! Precious, all. Thanks for sharing! 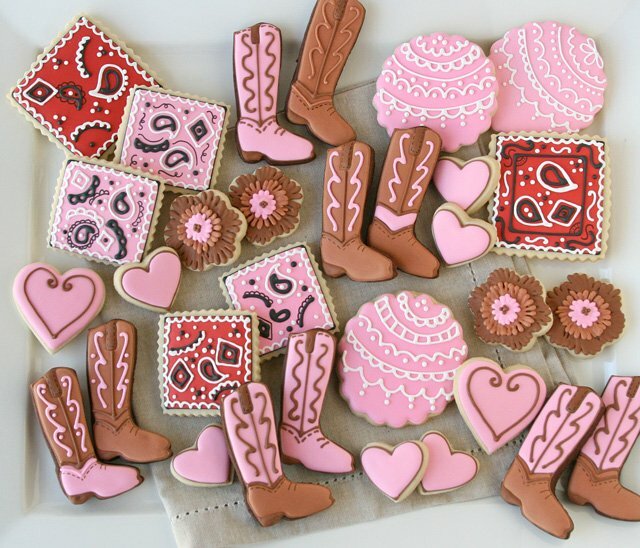 I have a friend that is a huge cowgirl fan and I will definitely try your boot cookies for her birthday gift next month. I just love this set! 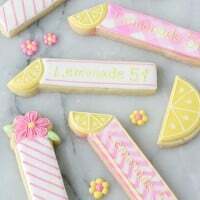 As always, your cookies are gorgeous!! Your cookies stole the show, beautiful! What a cute theme for a birthday party. That sweet table is adorable, especially with those little bales of hay. 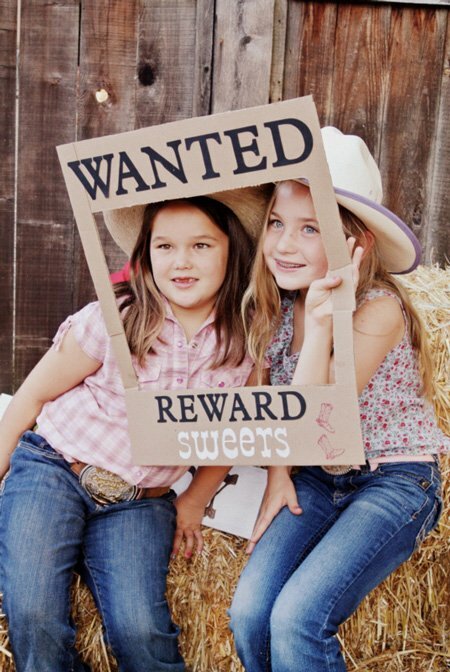 Your cookies are wonderful in their cowgirl theme and your bandana decorated ones are great! Looks like the theme and all the treats were a big hit. Great photographs. Oh, Glory, these cookies are totally adorable! You are so talented! I have to make these for my niece, that´s for sure. Yummy, these look so wholesome, great for a good brekkie! Glory, thanks so much for the tutorial and inspiration! I just made a cowgirl platter for two little girls celebrating their 8th birthdays cowgirl style! Couldn’t have done it without you! 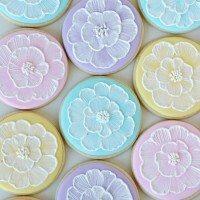 I have a question would you recommend using the royal icing or can i use icing from the supermarket? Hi Amanda, I would highly recommend using royal icing, as I have here. Feel free to experiment, but I believe you’ll find store bought icing will not give you the same effect.